“Amateur” historians and history buffs have long made substantial contributions to our understanding and preservation of local history. Whether as community advocates, genealogists or volunteers at historical societies and venues, they practice public history as a social commitment to their communities and to future generations. Local history collections are filled with works by such writers, which were created out of a desire to preserve and share local stories and local treasures. 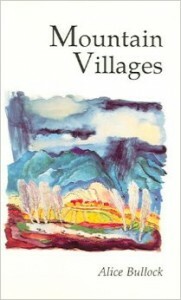 One such endeavor is Mountain Villages, first published in 1973 by Sunstone Press. Named a Santa Fe Living Treasure in 1985, a year before her death, Alice Bullock grew up in a coal camp near Raton, and over the years she was a teacher, newspaper writer, book reviewer for the Santa Fe New Mexican, and the owner of a dress shop where she sold her own designs. Her love of travel inspired her to write about, and photograph, small towns in New Mexico. She especially liked to explore old coal camps in Northern New Mexico, and other mountain villages in the area. Her stories of village life, the history of particular places, and her photographs bring alive these once thriving communities. Many of the photographs which she took for her books were donated to the Palace of the Governors Photo Archives in Santa Fe, a collection she used heavily to illustrate her publications. While not a trained historian or professional photographer, her books showcase her love of rural northern New Mexico, and they inspire her audience to do the same. Mountain Villages is packed with photos of moradas, barns, churches, and other vernacular architecture still extant in these villages in the early 1970s. Also from Alice Bullock is Living Legends of the Santa Fe Country, a collection of anecdotes about the sometimes otherworldly history of local buildings and sites. Tales of saints and churches, ghost stories, the history of haunted mansions, and legends of buried treasure are shared with the reader, both for enjoyment and as a means of preserving this local folklore. This volume also includes many photographs to illustrate the “legends” recounted here. Both Mountain Villages and Living Legends of the Santa Fe Country, as well as other books by Bullock, are still available from Sunstone Press.